Thomas Alfred Bernier (1844–1908) and his son Joseph (1874–1951) played active roles in the Franco-Manitoban community during the crucial 1870–1920 period in its development. Thomas Bernier, who practised law as a Crown Attorney in St. Jean, Quebec, was persuaded by his old classmate, Archbishop A.A. Taché, to move to Manitoba in 1880, with ambitions to become a farmer at Ste. Agathe. Instead, he embarked on a long and distinguished career in administration and politics, serving as Registrar of the University of Manitoba, St. Boniface reeve, French Clerk of the Manitoba Legislative Assembly and Senator (1892–1908). Thomas’ son, Joseph Bernier, was a well-known St. Boniface lawyer, politician and businessman. 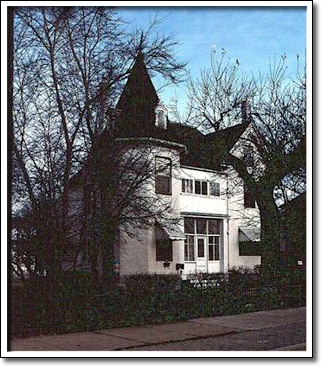 The Bernier house was designed by Aimée de Keroak, Thomas Bernier's cousin (and better known in St. Boniface as a bookseller), and was constructed in 1882. An elegant design, this eighteen-room home was one of the city's premier social, intellectual and political centres.